Sheffield, 2001. Two 15-year olds slug it out on court for the U15 British Junior Open title. One is a teenager from Surrey, the other a precocious Egyptian bidding to win his third successive BJO title. The young Englishman Tom Richards (right) manages to take the first game off Ramy Ashour, but cannot prevent his opponent come back to win 3-1. Little explanation is needed about what happened next for Ramy. The 21-year old current lies at 89 in the PSA rankings, from a best placing of 54 back in March 2007. This decline on paper hides an injury that kept him out of action for 8 months, and with recent performances in the US that have seen him compete against the world's best in the first round of the Oregon Open and Davenport Pro Championships, it appears that he is heading in the right direction. Now back in the UK, Richards just failed to qualify this weekend for the main draw of the Canary Wharf Classic. Chris Simpson from Guernsey, a contemporary of Richards', currently lies just outside the top-50 in the PSA rankings. The twice British U17 and U19 champion has also represented Guernsey in the Commonwealth Games. However - and perhaps worryingly for the medium-term professional game in the country - while England have 12 players ranked between 10-100 in the world (February 2008), only 2 of them (Richards and Simpson) can really be classed as relative newcomers to the professional tour (players aged under 23). In contrast, Egypt have 6 players in the same category, with 3 still being teenagers. It would be interesting to know what this is a result of: more investment in the game, more exposure to the sport at an earlier age, better training methods. It is well-documeted that while some junior players graduate successfully to the professional tour with apparent easy to speedily climb the rankings, others with promising junior careers struggle to become a force as adults. On that same day that Richards and Ashour were fighting it out for the U15 boys' title, the U17 girls had their first ever American British Junior Open champion. Michelle Quibell defeated the unseeded Australian Kasey Brown to take the trophy back to the US. What of Quibell now? Rather than being unable to adapt to the WISPA tour, Michelle is still playing college squash, but the sport is no longer her top priority. A Google search finds her happily studying at Yale, an environmental studies major and planning on going to environmental law school. With the last British Junior Open also dominated by young Egyptian players, a look at the current state of the British junior ranks seems timely. The recent British Under-19 titles were won by Joe Lee and Victoria Bell. 18 year-old Bell - currently 161 in the WISA rankings - will be hoping to follow in the footsteps of Victoria Lust (96), also a recent winner of the British U19 title - and move into the top 100. Things are therefore looking more healthy for England's women, with 10 players under the age of 23 positioned between 10-100 in the rankings. The former British U17 champion (2001) Lauren Siddall (left) attained her highest ranking this month (41) has made steady progress since joining the WISPA tour in 2004. The 23 year-old from Yorkshire has gone the "university route"*, rather then concentrate on the junior circuit, and it is beginning to pay dividends. 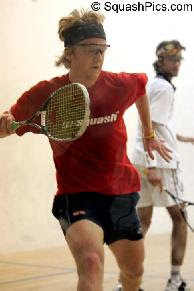 With other countries like France, Pakistan and the US also showing strongly in junior squash, it's the lack of English boys poised to make an impression in the senior ranks that could leave a gap when players like Lee Beachill and Nick Matthew come to retire. * An article on players who combine university study while aspiring to a professional squash career will appear on the site shortly.